Welcome to Still Learning, a not-for-profit education service working in partnership with the Sheffield Buddhist Centre. Still Learning provides high-quality tours and workshops about Buddhism and Mindfulness delivered by experienced practising Buddhists. Our sessions are fun and interactive, as well as designed to meet your learning objectives. 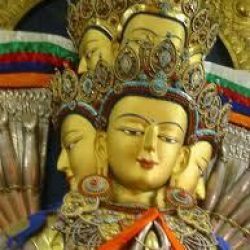 Why Visit Sheffield Buddhist Centre? Sheffield Buddhist Centre is a beautiful converted church situated in Walkley, Sheffield. We offer fun, interactive and informative tours of the Buddhist Centre, tailor-made to suit all key-stages. Tours usually last for 2 hours. Your pupils will experience first-hand the stilling atmosphere and the sights, sounds and smells of a Buddhist Centre, complete with two beautiful Shrine Rooms, a variety of Buddhist artwork and statues, and traditional Buddhist artefacts. What does it cost? Tours typically last 2 hours. Groups cost £5 per pupil. The minimum group charge is £75 per visit. When should I book? Please try to make any bookings at least one month in advance, which will help us to accommodate your preferred dates. Facilities: Disabled access is possible. Below are some examples of popular themes and workshops we offer, although we are always happy to work with you to develop new activities to suit the needs of your class. Most of these activities can be adapted to suit any key stage. Very popular with both students and teachers, this exercise will give you a taste of what it’s like to meditate. Learn some techniques from experienced Buddhist meditators that you can use every day to stay calm, grounded and positive. You will be amazed how still and quiet your pupils can be! It is not a specifically Buddhist exercise and is therefore suitable for people of all religions. It can be easily adapted to suit all ages. How did the Buddha become the Buddha? Who was he before? What is enlightenment? An understanding of the Buddha’s life story is an indispensible introduction to the religion. We draw out the key aspects using a beautiful painting that depicts the different events from the story. We often theme our tours and visits around the Three Jewels of Buddhism – The Buddha (representing the ultimate potential for human growth), The Dharma (the teachings of the Buddha) and The Sangha (the Buddhist community). Find out why the Three Jewels are common and central to all schools of Buddhism. Look at a slideshow of photographs of different Buddhists. What do the monks have in common? What about Buddhist nuns? Do you have to be a monk or nun to be a Buddhist? Learn about life as a Buddhist and the different types of Buddhism around the world. We have a range of exercises and activities, depending on ages and ability levels, exploring Buddhist ethics and their implications for how we might live as Buddhists. What are the five precepts? How do they affect how we live? Do you agree with the Buddha that living like this will make someone happier? What is karma? The Buddhist tradition is full of vivid artwork, images and symbols and our Buddhist Centre is full of interesting and beautiful paintings, statues and shrines. Explore stories associated with the images. What do these paintings and symbols say to us? Learn about Buddhists mandalas and then create your very own school (or personal) mandala. Suitable for all Key Stages A fun activity for all ages. Explore a range of traditional Buddhist artefacts. Can you guess what they might be used for? Pupils and teachers love the hands-on approach of this game. What is it like to be a Buddhist? Ask us anything you want and we promise to answer openly and candidly about our experience and lives as Buddhist practitioners. A chance to explore a Buddhist shrine. What is a shrine for? What goes on a shrine, and why? Can you build your own class shrine at school? What is a mantra? Hear us chant a mantra – how does it sound and feel? We tell the story of the child Siddhartha and his rescue of an injured swan using a beautifully illustrated book which pupils will love to look at. An excellent way of introducing the key Buddhist tenets of non-violence and loving-kindness to youngsters. Hear the story of the Bodhisattva Avalokitesvara, the embodiment of compassion, followed by a short art exercise. Pupils are asked to think of a way they could help someone and to write and decorate that on a paper hand. We then put all the hands together to make our own class version of the thousand-armed Avalokitesvara. A fun and engaging way of bringing the ethical precepts to life, and of illustrating the power we have to impact positively on those around us. It can be adapted to suit all ages, but is particularly recommended for KS2. One of our most popular activities, and particularly suitable for younger audiences. We dress up and act out a story from the Buddha’s life, communicating an important Buddhist idea about where happiness comes from. A fun pantomime-style drama, which ends up being a bit different every time we do it! Please note that this is only available by special arrangement, as it requires two Still Learning staff to support the visit. Why Book a workshop? If you can’t get to the Buddhist Centre, why not bring the world of Buddhism into your classroom with workshops tailor-made to meet your learning objectives? Our interactive and informative workshops can help bring to life any aspect of Buddhist life and teachings, including a taste of Buddhist meditation with our popular ‘stilling exercises’, suitable for people of any faith. Run by enthusiastic and committed Buddhists, who can speak directly from their own experience about what it’s like to live by the Buddha’s teachings. We are committed to finding a way to give students a first hand experience of Buddhism whatever the budget. Please get in touch with us to find out more. Still Learning was launched in 2009, in response to requests from teachers across the region. Since then we have worked with over 30’000 students and over 120 schools, universities and scout groups. All our team are DBS checked and a wide range of teaching experience. I first became interested in Buddhism as a teenager from a chance encounter with a book found in my school library. I was immediately struck by how Buddhism taught that I could change how I experience the world and that I could grow as a person. 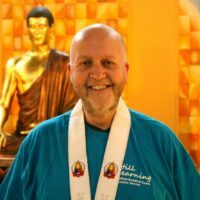 However, it wasn’t until many years later at the Sheffield Buddhist centre, that I began to commit myself fully to Buddhist practice as I saw that practicing Buddhist teachings was having a very positive impact on my life and on the lives of others. I was delighted to join the Still Learning Team in November 2018. My previous work has been as a teacher and as an artist and I feel privileged to be able to bring those skills together with my passion for Buddhism in order to teach children and young people about Buddhism. My involvement with Buddhism began some 25 years ago, when I went on an introductory course at Croydon Buddhist Centre. I was immediately struck by what I learnt about Buddhist ethics as being extremely practical, and yet deeply profound, ideals. Before the course was over, I was sure that I wanted to become a Buddhist, and that the Dharma (the teachings of the Buddha) offered the best way for me to live my life. 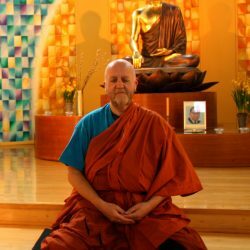 I was ordained into the Triratna Buddhist Order in 1999, and have been involved in teaching Buddhism and meditation ever since. I joined the Still Learning team in spring 2013, and constantly gain great delight in talking to children, and young adults, about Buddhism. The questions they ask, and the responses to our workshops and tours, can be both challenging and rewarding! I don’t feel that there could be much better use of my time than teaching children about such things as ethics, how we can have a positive effect on the world, and what Buddhism is all about. I was delighted to join the Still Learning Team in November 2018. My previous work has been as a teacher and as an artist and I feel privileged to be able to bring those skills together with my passion for Buddhism in order to teach children and young people about Buddhism. 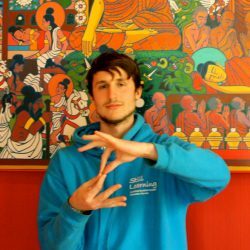 I first came into contact with Buddhism in my final year of university when I attended an introductory course at the Sheffield Buddhist Centre. I was instantly captivated by the revolutionary yet practical nature of the Dharma (teachings of the Buddha). I began to meditate and apply Buddhism into my daily life and found that it actually worked! I had started to view the world differently and in a way that made me happier. I gained great confidence by this and became a committed Buddhist practitioner soon afterwards. 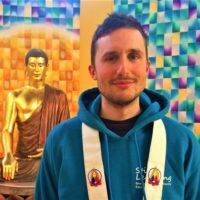 I enjoy sharing with others what I have learnt and how Buddhism has transformed me so I was delighted to join the Still Learning team in October 2013. We also offer mindfulness sessions or courses for pupils of all ages, and also for staff members. Please contact us for further details. Also, our friends at Clear Vision in Manchester have been working to bring Buddhism into schools for a number of years. They have produced lots of great resources to help staff and pupils study Buddhism. There are some very useful resources available and you can access them by clicking this link. #stilllearning is all set up and ready to go for the #new school term here in #Sheffield #sheffieldissuper book your #Buddhism and #mindfulness #workshops for your #school or #college now! Looking forward to a collaboration with @woodcraftfolk at beautiful Lockerbrook..